The Star Hampshire dance weekend is a relatively small but very friendly weekend of music and dance, held in one of the nicest places we could hope to spend a weekend of music and dance. Here's some information about Star Island and about the dance weekend. Photo CreditsBelow: Dancing on the Porch. Photo by Peter Yarensky, Sept. 16, 2012.Bottom: Star Island Twilight. 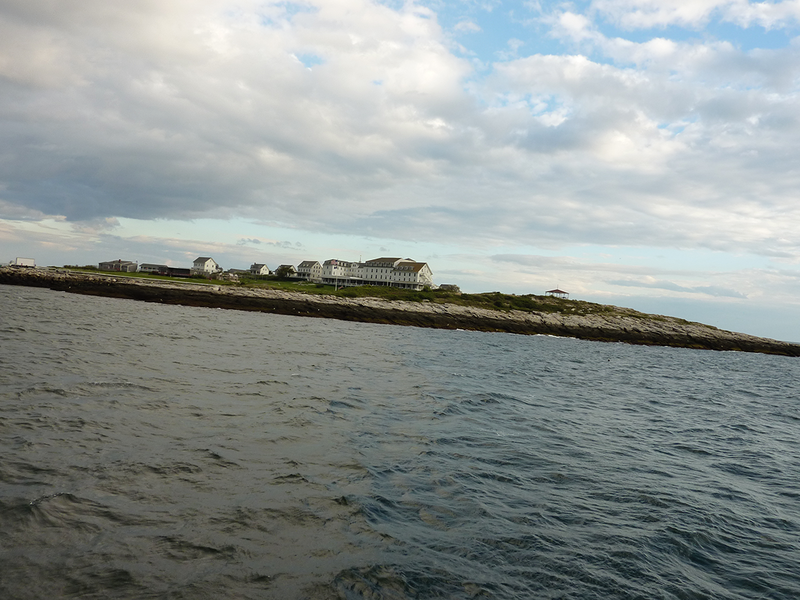 Photo by Peter Yarensky, Sept. 19, 2015.Star Island is part of the Isles of Shoals, several miles off the coast of New Hampshire. As our coastline is only 18 miles long it’s not hard to find. Transportation is by boat. We leave from Portsmouth Harbor traveling on the Thomas Laighton. Star Island is surrounded by the ocean, and home of a turn of the (last) century resort hotel with a large porch on three sides looking out over the ocean and with many comfortable rocking chairs. Thus, if you’re not dancing or engaged in other activities, you can hang out in a rocking chair and socialize, read, etc., while watching and listening to the ocean. Star Hampshire is a relatively small weekend of music and dancing, with a relaxed schedule and a friendly social atmosphere. There’s lots of good dancing, but there’s also time to walk around, explore, socialize, hang out on the rocking chairs, and take advantage of the other possibilities associated with the island. We are fortunate to be carrying on a living tradition: one that preserves the best of the old, but is constantly changing. Our traditions have been influenced by a wide variety of people who have come to live here: Canadians, both English and French; Irish, Scottish, Scandinavians and others. These influences contribute to the rich program of the Weekend. Here is a description of some of what you might expect to find at the weekend. You will receive a set of orientation materials well before the weekend that will describe the weekend, what to expect and how to pack in more detail. Music & Dance. The staff is chosen for its ability to present an excellent, varied program. The emphasis is on New England contras and squares. Depending on the skills and interests of the staff, we have included a variety of additional programming such as singing, English country dance, couples dances and international folk dance. The Program. The weekend features evening dance parties, daytime workshops, staff concerts, and more depending on the staff. Sometimes we can take advantage of activities of other conferences (e.g. singing, yoga) and sometimes they join us for dancing; all by permission of course. There are jam sessions, workshops, and there’s a waltz session before breakfast. Dancing! Did I mention that already? There are generally between 50 and the maximum of 80 dancers each year. The dancing is always fun. It generally includes a good mixture of traditional and modern contras and squares. There are often some unusual dances included in the program, and generally the dancers who have been dancing all weekend can handle them. When the ferry schedule permits, we hold a final dance on Sunday is on the hotel porch; what a nice place for a final dance party! We do sometimes have members of other conferences join us; and we invite the Pelicans (Star staff) to join us for the evening dance. What they lack in polish the more than make up for with enthusiasm! Nondance events include the chapel, singing sessions, jam sessions, social hour, staff concerts and more. Here’s a description of the chapel from David Millstone; many consider it to be one of the highlights of the weekend. “You can participate in a memorable camper-organized non-denominational chapel service by climbing in silence to the historic stone meeting house and sitting in candle lantern light as dancers and musicians share tunes, songs, stories, and poems.” And of course don’t forget hanging out on the wonderful porch in a rocking chair by the ocean; that is in itself one of the more enjoyable experiences in life. The Unexpected! Since it’s on an island interesting things can happen. Major storms have blown up causing people to have to be very careful, go indoors, etc. Hurricanes have forced cancellation of some or all of the weekend, or at least worry about whether it would occur on more than one occasion. On the other hand, it’s hard to beat seeing the Northern Lights from Star Island, and watching the waves; especially during a storm. And don't forget the spectacular sunsets. It’s a great place to hang out, which is why there’s more free time built in to the schedule than in most other music and dance weekends and why no one complains about it.